This recipe was given to me by one of the members at the gym, and they are the perfect energy boost for a mid-day snack! You can eat them straight from the freezer, or let them thaw for a more chewy consistency. I always double this recipe when I make it, since the small bags of nuts in the baking section of the grocery store are 1 cup each (although doubling it will not work with a small food processor, only a large one). In a food processor, grind almonds, pecans and peanuts into a fine powder. Add cocoa and salt and process a few seconds more, until mixed. Pour the mixture into a bowl and set aside. To the food processor, add dates, hot water and maple syrup. Process until smooth and creamy. Add the cocoa and nut mix back to the food processor and pulse briefly. Scoop the mixture out of the food processor and put back into the bowl. Add the walnuts to the food processor, and process for a few seconds, until the walnuts are in small pieces. Pour the walnut pieces into the bowl, and using a spatula, fold into the cocoa nut mix. 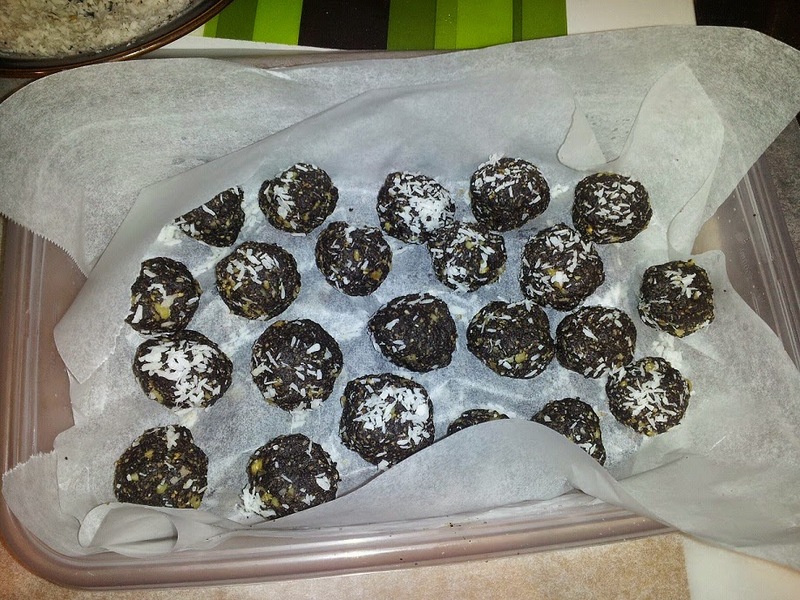 Roll spoonful size pieces into balls, and coat with coconut or chia seeds, if desired. Layer onto waxed paper and freeze until serving.